This Fun Diaper Cake will give you some great ideas for making your own! 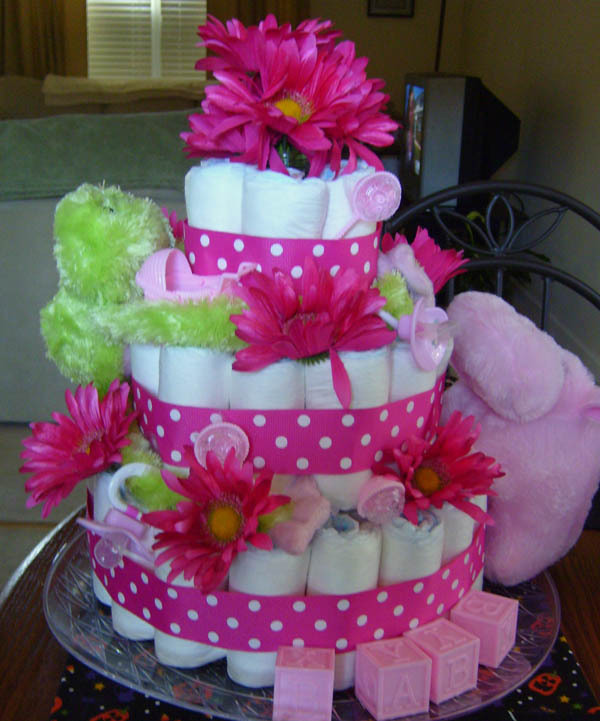 Bright colors, cute gifts and a creative design are necessary for a fun diaper cake. The diaper cake below has all these and more, and is a wonderful example of a happy and hip diaper cake. Heather has submitted this wonderful diaper cake for all of us to enjoy, and after looking at her pictures, we can all receive inspiration to make our own. Heather continues to "Pay if Forward" to the rest of us by submitting her creative ideas and sharing her experience. What amazing readers we have. Thanks, Heather, for your bright and beautiful diaper cake! I used a pack of 56 diapers from Walmart. I used parents choice brand and they were only about 6 dollars. I got the fake flowers from walmart 2 bunches for a dollar. The ribbon came from Walmart and was about 3 dollars. The pacifiers were 96 cents for two from Walmart and the two bottles used for the middle was only 98 cents each! The stuffed animals and light pink baby girl decorations came from the Dollar Tree! I think all in all I only spent under 20 dollars. The mom to be loved it! What a darling diaper cake, Heather! Thanks so much for sharing!! 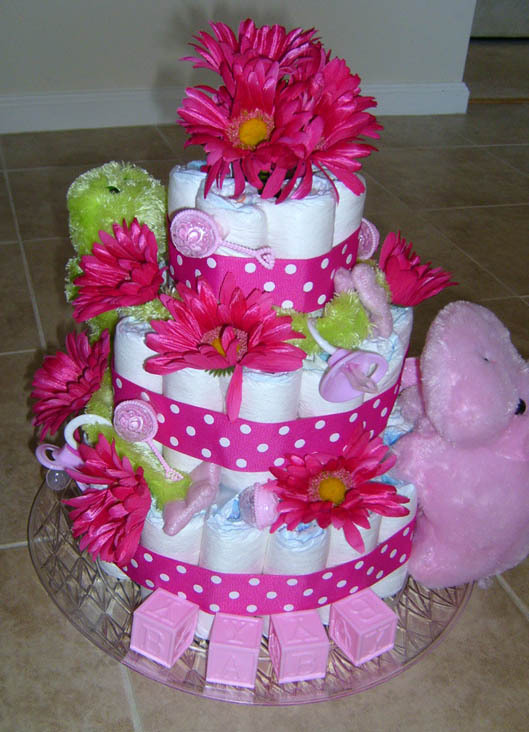 Want to make your own diaper cake, but don't know where to begin? Here are simple, illustrated diaper cake instructions that show you how!